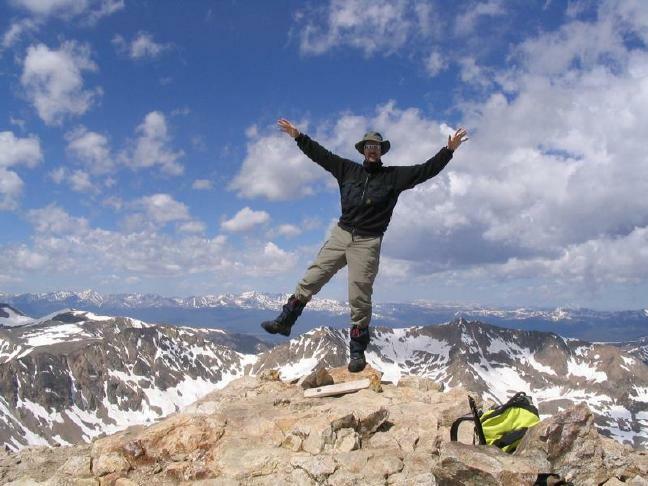 I've lived in Colorado almost a year now and, as an ardent peak-bagger, it pains me to say I've only successfully climbed one of the state's famous 14,000' peaks. This is not to say I haven't attempted more -- there was our initial, unprepared assault on Mt. Bierstadt and a tortuous near-summit of Quandary Peak -- but so far we've only been successful on our second attempt at Bierstadt. 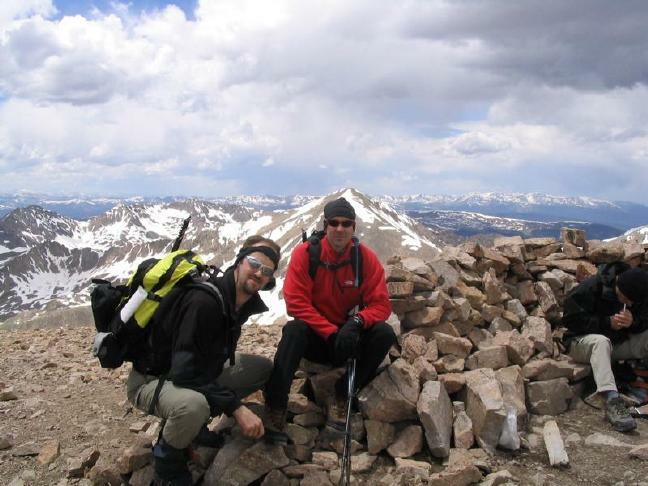 Of course, I've also climbed a number of 13ers more challenging and comely than mountains which happen to be a few hundred feet taller, but the world cares little for these 'second-rate' peaks. Time to get a few more official peaks under my boots! 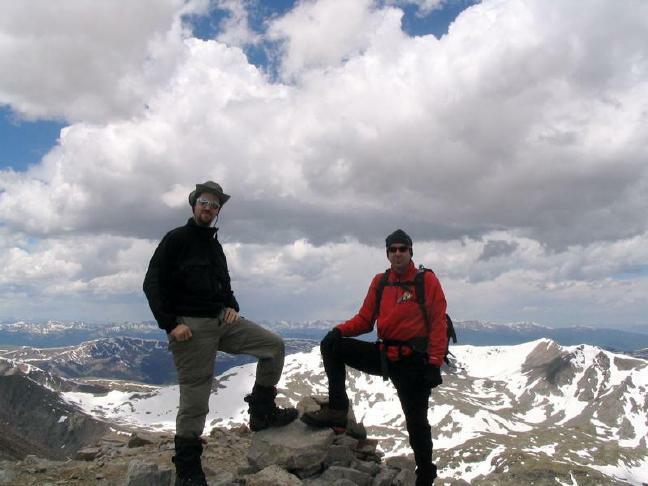 The plan was to bag as many 14ers with a minimum of effort. From the Kite Lake trailhead in the Mosquito Range south of Breckenridge, Quandary, and Pacific Peak, a quartet of high mountains can be climbed in a seven mile circuit with minimal elevation gain. Three of these peaks (Democrat, Licoln, and Bross) are official 14ers. The fourth, Mount Cameron, is tall enough, but is not appreciably separated from Mt. Lincoln. The resulting circuit is very popular and is known as the Decalibron. Justin and I met up at 4:30 in Boulder and headed south and west in a dense fog. By the time we'd reached the Divide, the fog had cleared and we we could see peaks in all directions. We drove past Breckenridge and the Quandary Peak Trailhead (spotting a black bear in the process), and crested Hoosier Pass. 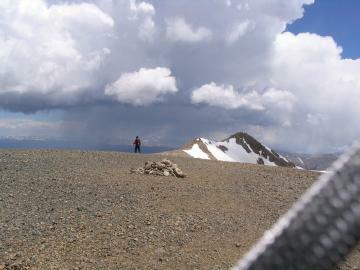 The weather south of the Divide was more reminiscent of our previous conditions. Dense fog shrouded everything and visibility was minimal at best. The Kite Lake Road is easily located from the center of Alma, and we drove up the valley on increasingly rough dirt road. By the time we broke above treeline (did I mention that this is a high trailhead? ), the road was pitted with foot-deep holes and deep ditches. Justin persevered and we arrived at the trialhead at 7am. ...but soon becomes gorgeous! Kite lake and the trailhead below with Buckskin Mountain (a high 13er) in the distance. There were hints that the fog was lifting, so we packed up and headed out in the company of some casual hikers from Iowa. A quarter mile up the valley, the fog finally cleared and the amazing cirque around us was revealed. To the north lay Democrat, Cameron and Bross. Kite Lake, still largely frozen, lay behind us with Mt. Buckskin looming above. There was no snow on the flats, but a good deal of Democrat's south and eastern flanks still had good snow coverage. We decided to avoid the main cattle trail and took to the first available snowfield. Donning crampons and deploying our axes, we made steady progress up the 30-degree snow. Justin, despite his climbing prowess, had never done a snow climb before and was a quick learner. We surmounted the cliff-band and started up another, larger snowfield aiming for a likely looking cleft in the ridgeline. The slope steadily increased and the snow conditions varied wildly from place to place. Finally, we surmounted a 50' section of steeper snow (probably 45 degrees or more) and emerged on the ridge at about 13,000' surrounded by talus. Looking up at the slopes of Democrat. Our snow route winds to the right of the cliff band and then heads left to intersect the tallus slope. The rest of the ascent of Democrat went smoothly, if slowly. We picked our way across steep, shattered rock occasionally finding what looked like bits of trail, but usually just making our way slowly upward. We could see a dozen or so people (including the Iowans) below and on the ridge to the north. We were clearly the only intrepid souls to try the mountaineering approach today. At long last, we surmounted a false summit and beheld the snowfield leading up a few hundred feet to the actual peak. We arrived a little after 10 and set about having lunch and taking in the views. A very satisfying summit and still good weather though large black clouds could be seen cruising into the area from the west. Justin and I display two different reactions to a successful summit. From here, we took to the normal trails. 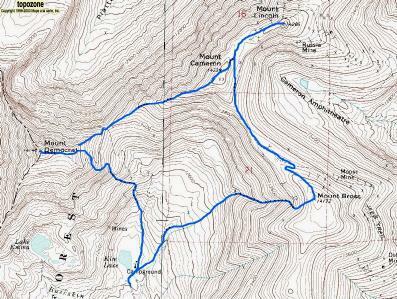 We descended Democrat via the east ridge via rough trail (but at least it was a trail) to the saddle with Cameron. The weather was deteriorating and it was starting to snow on us. Justin wasn't feeling great, but agreed to give the Cameron ridge a try at least a little ways. 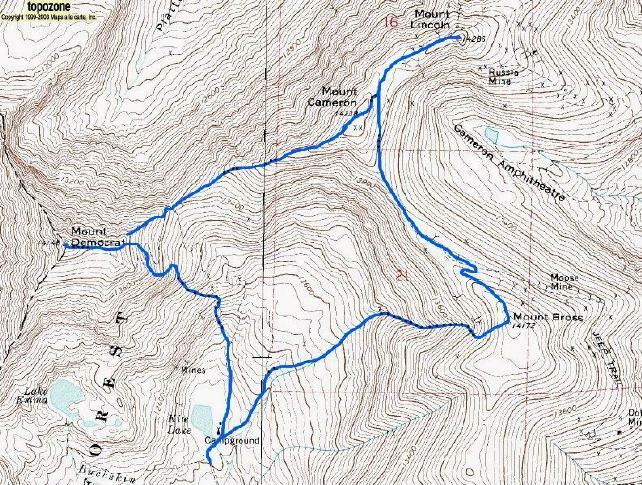 Fortunately, his condition improved and with it the weather and soon we had ascended about 900' on easy ridge-top trail. The rocks changed dramatically from the angular gray massive tallus of Democrat to red, fine-grained gravel and sand. The summit of Cameron hove into view but the actual highest point was somewhat hard to determine; all around us was a lump of coarse beach sand with occasional, low alpine plants sticking up like prehistoric cabbages. The wind was so feirce we didn't even slow down as we traversed the summit and descended a short, soft snow slope on the east side. From here, it is a simple half-mile hike across similar desert/beach conditions to the double-peaked ridgeline summit of Lincoln. The weather had improved, but still threatened thunder. Furthermore, we'd gotten a later start than I liked and I was anxious to do our business and get down. The summit of Lincoln was definitely more satisfying than Cameron with a small rocky roost surrounded by views in all directions. Licoln is the 8th highest peak in Colorado and will likely remain my personal highpoint for at least a little while. Justin doesn't even slow down as he summits Mount Cameron (marked by the large cairn) and heads on to Lincoln in the distance. Standing proud on the 8th highest peak in Colorado, Mount Lincoln. Hurrying on, we re-traversed to Cameron and then undertook the long, trivially easy traverse to the Cameron-Bross saddle. The trail here is so gentle and wide, you could drive a jeep on it. Indeed, we saw one driving around up there looking somewhat out of place. Mounts Cameron and Lincoln from the northern slopes of Mount Bross. It's all pretty gentle up here. Vicious cross-winds hit us from the west on the saddle and we were glad to reach the shelter of a crescent of rocks built on the summit of Bross. Summit is perhaps too strong a word for this high point; like Cameron, it was a vast plain of red rocks and gravel with hardly any vertical extent at all. Briefly confused, I hiked a bit farther south to see if a large cairn there marked a higher point. Convinced that it didn't, I returned to the summit, had our photos taken, and started the descent. No, really, this is the summit of Mt. Bross. The only reason it looks curved at all is because this is a very wide panorama. Better to think of it as a 14,000' beach and have done with it. Mts. Democrat, Cameron and Lincoln protrude from the local horizon. After four mountains, we were beginning to look a bit grim. The descent of Bross was definitely the most interesting part of the mountain. There are two routes usually taken: a deep, S-shaped couloir on the west face or the talus-covered ridge directly to the south of it. Since we'd seen copious snow in the couloir, we opted for this route. Time for glissading! Snow conditions were not ideal, but enough other people had descended this way today that a nice trough had been worn in the snow. Within a hundred yards, we were both soaked and wondering if the seats of our pants had been abraded away to nothing. Various other glissade techniques were tried (standing, belly, running) and eventually, soaked to the core but giddy with all the fun, we emerged back into the cirque above Kite Lake. Bad weather still had failed to materialize and we hiked the half mile back down to the parking area in sunshine and good spirits.